A Nipomo woman transporting a wanted suspect led several law enforcement agencies on a high-speed chase Thursday that started and ended in Santa Barbara County and traversed southern San Luis Obispo County. Though officers arrested the driver and another suspect, they lost track of the man who was wanted in the first place. Shortly before 3 p.m., Santa Barbara County Sheriff’s deputies tried to stop a white Lincoln Continental on Highway 101 at E. Donovan Road in Santa Maria. Deputies were searching for Nicholas McCloud, a passenger in the vehicle, who had violated his probation, according to the sheriff’s office. 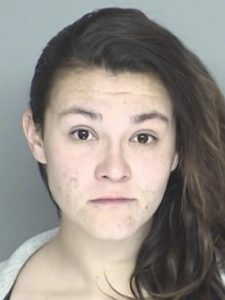 Felicia Hendricks, 23, who was driving the Continental, sped off northbound through Santa Maria and into San Luis Obispo County. She exited the highway at Los Berros Road near Nipomo. Officers then briefly lost sight of the vehicle. Hendricks ran several red lights, and officers temporarily called off the chase. A sheriff’s helicopter then spotted the vehicle near Oakley Elementary School in Santa Maria. Santa Maria police officers saw a man and woman walking a few blocks away on Western Avenue who matched the description of Hendricks and McCloud. Officers tracked down the man and woman. The woman was Hendricks, but the man was Santa Maria resident Ruben Najera, 23. 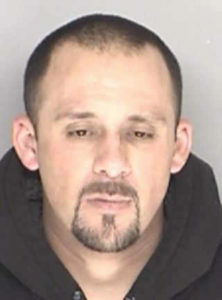 Najera was not involved in the chase, but he had two warrants out for his arrest. Police arrested Hendricks and Najera. Investigators later learned Hendricks and McCloud had broken into a person’s home while trying to escape. Hendricks and McCloud both face residential burglary charges in addition to felony evading in a vehicle. McCloud remains at large. Anyone who spots McCloud is encouraged to call law enforcement. I wonder if they do drugs…How come they always look the same! Sad how these lowlifes ruin it for the law abiding citizens. You can see meth all over her face.